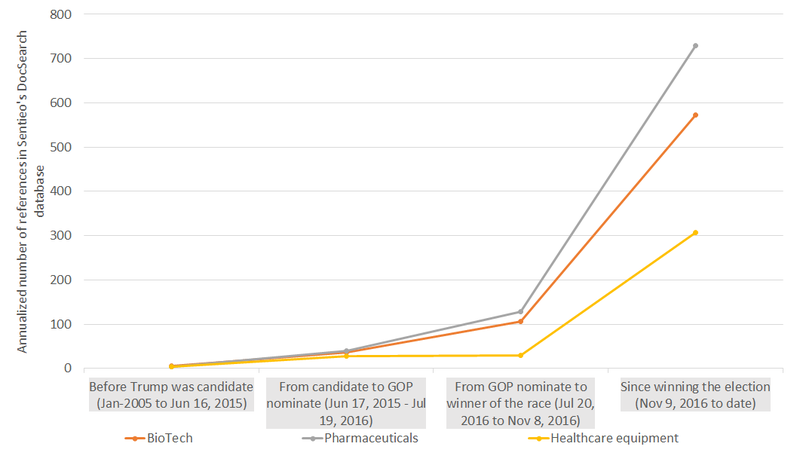 We compared the number of documents in Sentieo Document Search with references to Trump and to Obama during their runs for presidency. 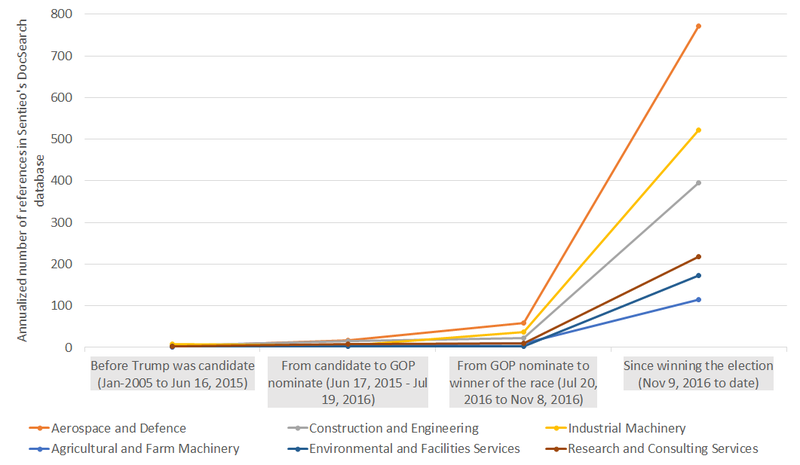 Trump beats Obama by an impressive average of 6 documents with mentions to 1 (6 times more)! 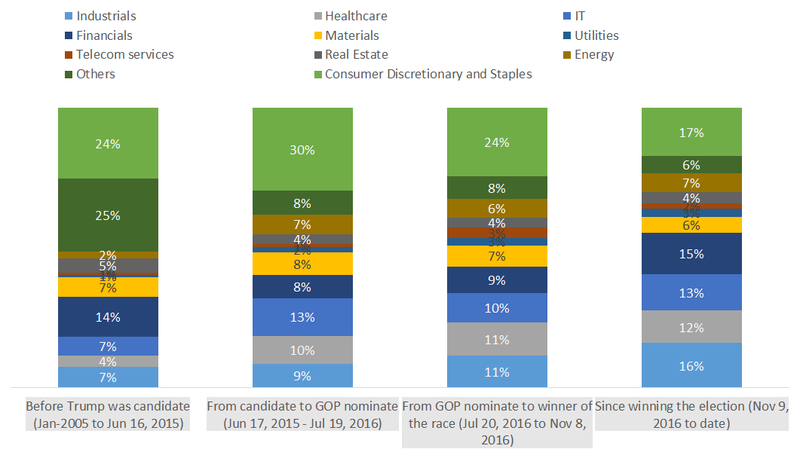 Even after excluding documents with mentions related to Trump’s long-running history with public companies (which are unrelated to his successful presidential run), Trump is still ahead by a comfortable margin of 2-to-1. President Trump’s momentum is so strong that he also beats by +15% the run-rate achieved by President Obama in the months following Obama’s re-election. At the time, Obama mentions benefited from Obama already being in office and being involved in initiatives influencing the economy and captivating the market’s attention. This is therefore again an unusually strong level of attention generated by President Trump. 1/ Industrials has gradually moved from 7% to 16% of all references. Donald Trump started his campaign with bold and memorable arguments including the intention of building a Wall with Mexico to stem immigration. He also outlined a major infrastructure rebuild program of $1 trillion to address the “terrible” state of the US infrastructure and to “make America great again”. Trump then discussed building “the next generation of roads, bridges, railways, tunnels, sea ports and airports”. Along the same lines, Trump has pledged higher spending on Defence ($80-90bn (+15%) more than Obama’s 2017 military budget). The details of the plan remain however unknown, which could explain the on-going document generating debates market participants are having at the moment. 2/ Tech (IT): Tech moved from 7% to 13%. Tech was a premature and unlikely victim of the populist rhetoric used by President Trump in the early days of the campaign. Talks of H-1B visas being “unfair for [US] workers, and [that the US] should end this” raised questions that Silicon Valley companies will not be able to source properly the talent they need. The worries subsided shortly after when Trump said: “I was not at all critical of [Mark Zuckerberg]. I am all in favour of keeping these talented people here so they can go work in Silicon Valley. You can call it visas, you can call it work permits, you can call it anything you want. As far as the visas are concerned, if we need people, it’s fine”. This led the share of Tech to decline to 10%. 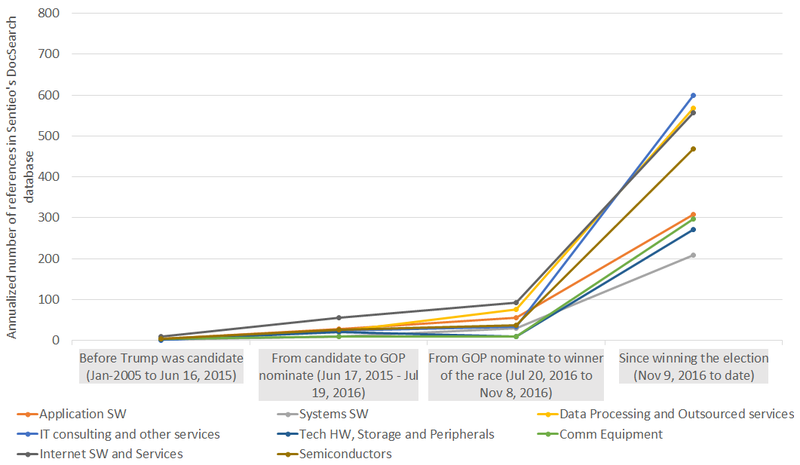 Around the time Trump won the election however, Tech went back again to 13%, as the market started to assess the effect of the various coming changes such the cut to corporate tax from 35% to 15-20%, the tax holiday on cash repatriation (only 10% instead of 20%+), the fiscal stimulus (is some of that infrastructure money going to broadband infrastructure? ), and the likely loosening of current Net Neutrality framework (How much are Netflix, Youtube, Amazon Prime, Facebook, Twitter losing out to Verizon, Comcast and AT&T?). 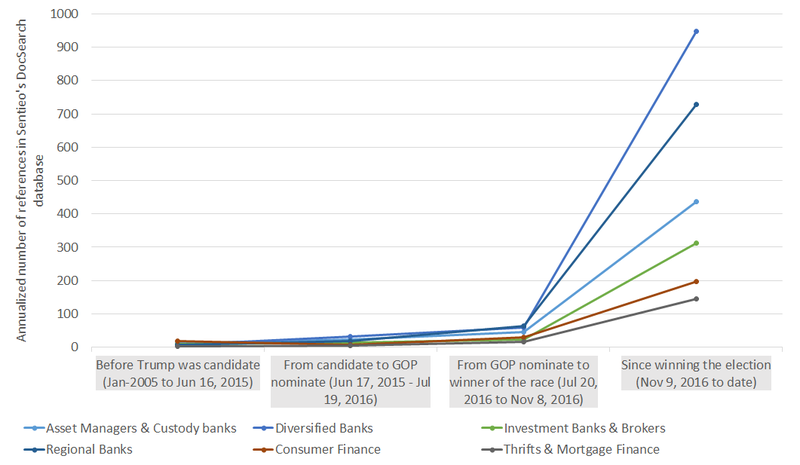 3/Financials was not much in focus in the early days of the campaign (only 8% between Jun’15 to Jul’16), but it gained a significant boost after the election (now 15%). 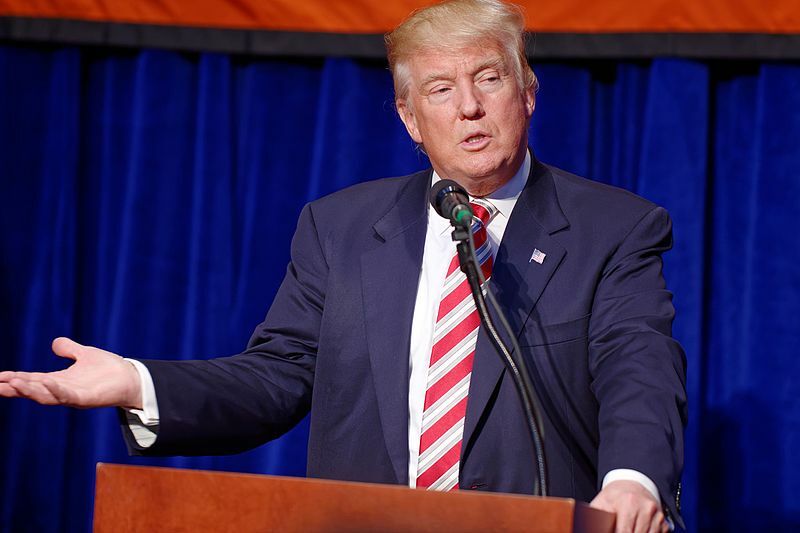 Towards the end of the campaign, Donald Trump said he plans to roll back some of the financial regulation put in place during the Obama years, including Dodd-Frank and the Consumer Financial Protection Bureau. This, and the likely rise in interest rates as a result of a higher inflation, would make banks more profitable. All this was widely covered by myriad research reports following election day. 4/ Pharma/Healthcare moved from 4% to 12%. Healthcare was an on-going theme during the campaign. Trump criticised Obamacare for months and repeatedly said he wanted to repeal it. While he also made broad statements regarding drug prices, it is only during his first post-election press conference that he started to provide details on his plan: the potential for the US government to leverage its scale to negotiate good drug pricing. The debate will likely remain intense until a detailed plan is unveiled by the White House. 5/ Consumer Discretionary and Staples started at 24% and but now represents only 13%. This is where most of Donald Trump’s activities outside of Real Estate are classified. 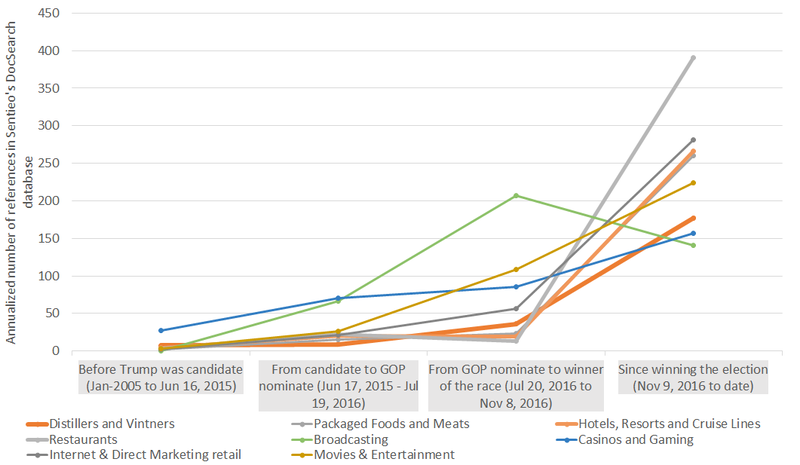 This includes Trump’s Casinos but also a lot of branding licensing deals such as with Drink Americas (“Trump Vodka”), Estee Lauder (“Donald Trump the Fragrance”), PVH, an apparel company, to sell shirts and neckwear (“Donald J Trump Signature Collection”) or GFTI, a publisher (the “Trump Magazine” ). Understandably as the race to the Presidency took the centre stage, the Consumer part became of a lesser importance despite also rising somewhat. Takeaway 3 – where have all the controversial ideas of the early days gone? The populist ideas used in the early days of the campaign to build traction has broadly disappeared from the document flow (for now…). Long forgotten are the references to the Wall with Mexico (2 references out of 4317 documents since Election day), the registration of Muslim aliens (none), or the amendments to bank regulations to prohibit illegal aliens from sending money outside the US (no references to Section 326 of the Patriot Act—31 CFR 130.121). The first few days in office have shown however that President Trump will make efforts to hold to at least some of these early promises. We therefore suspect that references to those will make a come back soon, especially as myriad corporations and industry leaders have now officially joined the public protests in voicing their frustration against the new hardened alien vetting programme. We intend to circle back after the first 100 days with further analysis, so stay tuned for a follow-up post! So, what issues were mentioned the most? The most discussed topic overall was the $1trn fiscal stimulus, which includes large investments in infrastructure and higher military budgets. After that, the roll-back of parts of Obama care and on-going attack on drug prices led to a lot of chatters to see who would be the potential losers ((i)price pressure hurting US drug vendors, (ii) those who banked on Obamacare), or winners (possibly more market access to foreign drug vendors to help drive prices down). in the later stages of the campaign, analysts discussed across all sectors the potential benefits or impact of the lowered corporate tax rate and the tax holiday and cash repatriation. Then the other big topic was the roll-back of heavy financial regulation put in place after 2008, and how that and return of inflation will help banks improve profitability. Finally, analysts briefly (only briefly – 300 references out of thousands of references!!) discussed the potential impact a crackdown on H-1B work visas would have in particular on the Tech industry since it sources a lot of its highly skilled workers from overseas. This faded quickly however after Trump alluded that these would probably be fine. (we put a quote actually in the note – Takeaway 2 -> section 2). The biggest chunk of the chatter on Tech was on the reduced tax rates, and what the companies could do potentially with the cash they would bring back home. There were other themes but which were even less widely discussed and only in broad terms such as inflation in general, stock market volatility, mixed views on were is the US dollar going. how would the garment and apparel sector (100% of the clothing is made overseas now!) deal with high taxes on import from China which Trump has and keeps talking about. Our Methodology is based on statistical analysis provided by Sentieo Document Search. Sentieo Document Search is an extensive database of all the filings including 10-Ks, S-1s and 10-Qs, company press releases, presentations, transcripts and research reports from current and past public companies. In total, it currently holds 9.4 million documents (and growing). The search engine allows to split searches by sector, subsector, market cap and other financial metrics, and provides automatically results for synonym and related queries where relevant. In this study, we focused on Mr Donald J. Trump by adding “modifications” to a simple “Trump” query, in order to exclude references to his brother Robert, his ex-wife Ivanna, and his daughter Ivanka, all three regularly mentioned in financial documents which are irrelevant to Donald J. Trump. We also refined the results by excluding references which were exclusive to his properties (eg: Trump Plaza) and licensed products (eg: Trump Vodka) without mentioning at the same time Donald J. Trump himself.